" This is a gift!!! It has been secretly placed here among everyday items simply for you to discover and enjoy. I am one of the many artists who want to share a small slice of what we love to do. If you are so inclined, please send a message to this email address to inform us of it's fate." 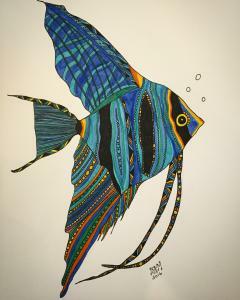 I'll be making prints of this angelfish this weekend and I'm trying to think of a good place to abandon a print where the elements won't harm it. We have the RNC in Cleveland this week so I'm planning to plant him amidst the chaos to counter with love.